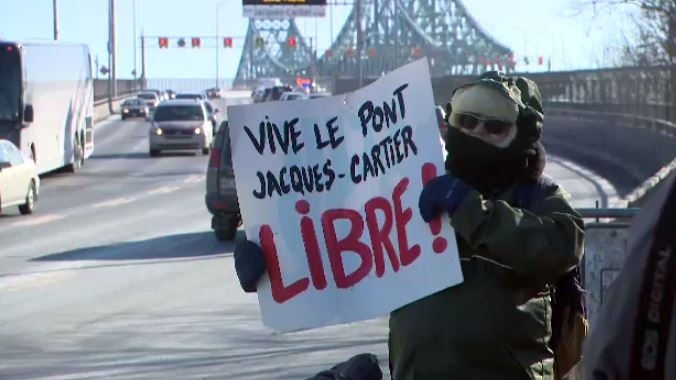 Despite the chilly temperatures, on Sunday dozens of cyclists took to the Jacques-Cartier Bridge to demonstrate against the winter closure of its pedestrian and bike lanes. The bridge has been closed to cyclists and pedestrians for years, with winter demonstrations almost becoming an annual tradition. He said that despite countless meetings, the bridge corporation has refused to open it during the winter months. “Initially, we were asking just for the gates to be opened,” he said. Jacques Cartier and Champlain Bridges Incorporated (JCCBI) is the government corporation that runs both bridges. In a statement, the JCCBI cited three challenges that pose winter safety risks to foot and bike commuters: weather conditions of the St. Lawrence River, the path’s irregular geometry, and the risk of falling ice. Muchnik said that he’s biked across the bridge in all conditions and doesn’t agree with the corporation’s reasoning. Others at the demonstration have found that the bridge’s closure interferes with their exercise and fitness regimens. She also brought up climate change. Near the end of the event, some commuters broke the bridge’s rules by hopping over the gate. For years, bikers and pedestrians have asked the bridge's administration to have it open during winter for pedestrians and cyclists.